Goodbye stuffy office cubicles, hello cool co-working spaces. Are you aware of this new trend in the workplace? Co-working is a fresh alternative for a traditional office space. It allows you to work in a setting with other creative, driven, small businesses. A special energy is created from the environment, allowing everyone to thrive off of each other’s positivity. Working from home is fine, but it is easy to get distracted. A co-working space encourages you to stay focused, yielding maximum productivity. Co-working also gives businesses the opportunity to establish a strong network and build relationships. You have the ability to easily collaborate with others who can provide thoughtful feedback and fresh ideas. Another great fact about coworking is the unique locations they are hosted in. They are typically very modern and trendy, with cool vibes, that would otherwise be very costly and unattainable in a large city. The spaces also often include free Wi-Fi and refreshments, which is always a plus. Shantel, the host of Imagine More, has worked in coworking spaces. If you didn’t know already, she is the CEO & Co-Founder of Imagine Media Consulting. 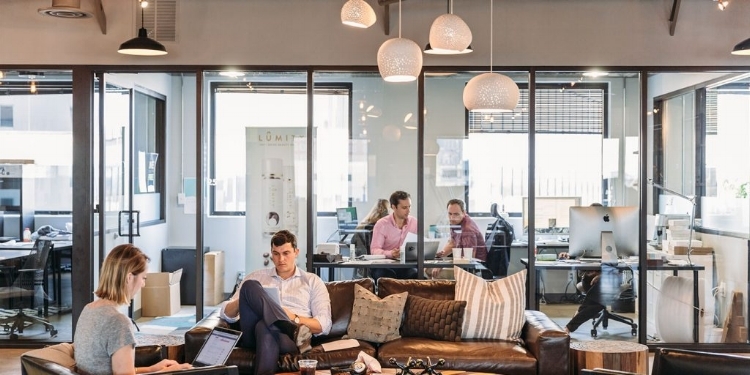 During the first years of Imagine Media, they utilized the Industrious co-working space at the Atlanta - Midtown location, as well as the co-working space located in Ponce City Market.